As of June 30, 2010, the aggregate market value of the registrant’s common equity held by non-affiliates was approximately $24,495,459 computed by reference to the average bid and asked price of the Common Stock. For the purpose of the foregoing calculation only, all directors and executive officers of the registrant are assumed to be affiliates of the registrant. Such determination should not be deemed an admission that such officers and directors are, in fact, affiliates of the registrant. At March 3, 2011, there were 51,516,635 shares of the registrant’s Common Stock outstanding. The statements contained in this report that are not historical facts are forward-looking statements that represent management’s beliefs and assumptions based on currently available information. Forward-looking statements include the information concerning our possible or assumed future results of operations, business strategies, need for financing, competitive position, potential growth opportunities, potential operating performance improvements, ability to retain and recruit personnel, the effects of competition and the effects of future legislation or regulations. Forward-looking statements include all statements that are not historical facts and can be identified by the use of forward-looking terminology such as the words “believes,” “intends,” “may,” “will,” “should,” “anticipates,” “expects,” “could,” “plans,” or comparable terminology or by discussions of strategy or trends. Although we believe that the expectations reflected in such forward-looking statements are reasonable, we cannot give any assurances that these expectations will prove to be correct. Such statements by their nature involve risks and uncertainties that could significantly affect expected results, and actual future results could differ materially from those described in such forward-looking statements. Among the factors that could cause actual future results to differ materially are the risks and uncertainties discussed in this report. While it is not possible to identify all factors, we continue to face many risks and uncertainties including, but not limited to, the cyclicality of the titanium dioxide industry, global economic and political conditions, global productive capacity, customer inventory levels, changes in product pricing, changes in product costing, changes in foreign currency exchange rates, competitive technology positions and operating interruptions (including, but not limited to, labor disputes, leaks, fires, explosions, unscheduled downtime, transportation interruptions, war and terrorist activities). Mining operations are subject to a variety of existing laws and regulations relating to exploration and development, permitting procedures, safety precautions, property reclamation, employee health and safety, air and water quality standards, pollution and other environmental protection controls, all of which are subject to change and are becoming more stringent and costly to comply with. Should one or more of these risks materialize (or the consequences of such a development worsen), or should the underlying assumptions prove incorrect, actual results could differ materially from those expected. We disclaim any intention or obligation to update publicly or revise such statements whether as a result of new information, future events or otherwise. There may also be other risks and uncertainties that we are unable to predict at this time or that we do not now expect to have a material adverse impact on our business. Throughout this report, unless otherwise designated, the terms “we,” “us,” “our,” “the Company” and “our company” refer to White Mountain Titanium Corporation, a Nevada corporation, and its subsidiaries. All amounts in this report are in U.S. Dollars, unless otherwise indicated. White Mountain Titanium Corporation is an exploration stage company, which means we are engaged in the search for mineral deposits or reserves which could be economically and legally extracted or produced. We were incorporated in the State of Nevada on April 24, 1998. We have two wholly owned subsidiaries, namely Sociedad Contractual Minera White Mountain Titanium, a Chilean stock company which holds our Chilean mining concessions and conducts our principal operations, and White Mountain Titanium (Hong Kong), a Hong Kong company, which is inactive. Our sole business plan is to explore for titanium deposits or reserves on our Cerro Blanco mining concessions. On September 15, 2010, we entered into a non-exclusive, non-transferable, non-assignable sublicense agreement with La Serena Technologies Limited, a Hong Kong company (“La Serena”), for the sublicensing to our Chilean subsidiary of titanium metal technology developed by Chinuka Limited plc (“Chinuka”) and licensed to La Serena. Under the terms of the sublicense, we have the right to use the technology in the process of electrolytic extraction of titanium concentrate or any alloys to produce sponge titanium metal as set forth in the patent applications filed by Chinuka. We are obligated to make quarterly royalty payments from the gross receipts generated by the technology and we issued 4,000,000 shares of our common stock as an initial royalty. The shares are to be held in escrow and are deliverable as follows: 1,000,000 immediately and 375,000 at the end of each of the next eight calendar quarters. We are obligated over the next 5 years to make cumulative expenditure of $5,000,000 towards the development of the technology. We must also make minimum royalty payments of $200,000 per year with the first of such years starting on and from the day after the 5th anniversary of the sublicense, and we must commence commercial production of product starting in the year beginning on the day after the 9th anniversary of the sublicense. The sublicense will continue until it is terminated by one of the parties for breach of the agreement or insolvency. The sublicense may also be terminated by La Serena if there is a change of control of Sociedad or our company, or if Sociedad disposes of all, or substantially all, of its business and/or assets. In January 2011 we received our first report on lab scale test work of the technology developed by Chinuka, which test work is continuing at the University of Cambridge in the United Kingdom. This testing includes the refining and electrolytic deposition of pure titanium from lower grade concentrate which as produced small quantities of sponge using ultra-fine concentrate feedstock form our Cerro Blanco project. Current testing is focused on shifting to an investigation of adapting this new technology to produce titanium metal powder which would be a higher value product than sponge. Testing will also focus on using lower grade concentrate as a feedstock for the Chinuka technology to develop an application for use in the production of titanium pigment. Since October 2010 we have entered into three letters of intent for off-take agreements with pigment producers for the supply of standard grade rutile concentrate. Each of these non-binding letters is conditioned upon our completion of the bankable feasibility study on our Cerro Blanco project. During 2010 we continued to progress toward completion of a bankable feasibility study for our Cerro Blanco project. We commenced and have completed over half of the projected 7,500 meter drill program. Drilling, mineral analyses, core logging and preliminary geological modeling are expected to be completed by the end of April 2011. We have also received our interim environmental report from Arcadis Geotecnica which incorporates data from the spring and summer baseline environmental monitoring field work as well as possible implications for flora, fauna and human habitation resident or adjacent to our project. This interim report also includes a detailed list of all future permits which, under Chilean mining law, will be required prior to commencing development of the project. We expect a final environmental report by the end of June 2011. We have also commenced discussions with the surface rights holder to the Cerro Blanco project to establish a mutually acceptable access corridor to the mine site. We anticipate completing the bankable feasibility study by December, 2011. In December 2010 we completed a $3,500,000 non-public offering of units at $0.65 per unit, with each unit composed of one share of common stock and one-quarter warrant. Each whole warrant entitles the holder to purchase an additional share of common stock at $0.65 per share. We realized net proceeds of approximately $3,186,947, after payment of selling commissions and non-accountable expenses totaling $306,000 and offering costs of $7,053. We also issued 429,170 selling agent warrants in the offering. The shares and warrants sold in the offering were not and have not been registered under the Securities Act and may not be offered or sold in the United States absent registration or an applicable exemption from registration requirements. Also in 2010 we adopted a stockholder rights plan that provided all stockholder of record at the close of business on January 28, 2011, a distribution of rights to buy shares of a new series of preferred stock if a person or group acquires or announces a tender offer for 15% or more of our common stock. On January 18, 2011, in connection with the adoption of the rights plan, we filed a Certificate of Designation, Preferences and Rights of Series B Junior Participating Preferred Stock with the Secretary of State of Nevada, which authorized the creation of a series of 500,000 shares of Series B Junior Participating Preferred Stock. Titanium is the ninth most abundant element, making up about 0.6% of the earth’s crust. Titanium occurs primarily in the minerals anatase, brookite, ilmenite, leucoxene, perovskite, rutile, and sphene. Of these minerals, only rutile, ilmenite and leucoxene, an alternation product of ilmenite, have significant economic importance. Both rutile and ilmenite are chemically processed to produce both titanium dioxide pigment and titanium metal. Approximately 95% of titanium is consumed in the form of titanium dioxide concentrate, primarily as a white pigment in paints, paper, and plastics. Titanium dioxide pigment is characterized by its purity, refractive index, particle size, and surface properties. The superiority of titanium dioxide as a white pigment is due mainly to its high refractive index and resulting light-scattering ability, which impart excellent hiding power and brightness. Titanium metal is well known for its corrosion resistance, high strength-to-weight ratio, and high melting point. Accordingly, titanium metal is used in sectors, such as the aerospace and chemicals industries, where such considerations are extremely important. Our business is currently focused on the mining concessions which constitute the Cerro Blanco property. These concessions host a hard rock rutile deposit as opposed to ilmenite laden mineral sands deposits held by most of our competitors. Rutile has a higher percentage of titanium oxide than mineral sands. The bulk of the world’s titanium is used as the metal oxide, titanium dioxide (TiO2). The chemically processed titanium ore, whether rutile or ilmenite based, is turned into pure titanium dioxide and used as a brilliant white pigment which imparts whiteness and opacity to paint, plastics, paper and other products. The use of titanium dioxide as a color carrier has grown over the last 40 years, since the use of white lead based paints was banned throughout the world for health reasons. Titanium dioxide is chemically inert, which gives it excellent color retention. It is thermally stable, with a melting point at 1,668ºC, which makes it suitable for use in paints and products that are designed to withstand high temperatures. About 5% of the world’s titanium is used as the metal, due to its exceptional properties. It has the highest strength to weight ratio of any metal; is as strong as steel but 45% lighter. The most noted chemical property of titanium is its excellent resistance to corrosion; it is almost as resistant as platinum, capable of withstanding attack by acids, moist chlorine gas, and by common salt solutions. The table below gives a summary of distribution and end uses on an industry by industry basis for TiO2. The table below gives a broad picture of principal uses for titanium dioxide. Paints, coatings, lacquer, varnishes, to whiten and opacity polymer binder systems, to provide coating and hiding power, and to protect paints from UV radiation and yellowing of the color in sunlight. To ensure high whiteness and color intensity, and increase plastic impact strength in such items as window sections, garden furniture, household objects, plastic components for the automotive industry. Additive to whiten and increase opacity of paper. Protection against UV radiation in high-factor sun creams; to give high brightness and opacity in toothpaste and soaps. High brightness and opacity in foods and food packaging. High chemical purity titanium dioxide is used as a carrier and to ensure brightness and opacity. Protection against fading and color deterioration. Titanium dioxide is used in chemical catalysts, wood preservation, rubber, ceramics, glass, electroceramics, welding fluxes, and high temperature metallurgical processes. Since 2004, an expanding world economy and industrial growth in China led to strong demand for titanium mineral concentrates, titanium metal and titanium dioxide (TiO2) pigment. According to the U.S. Geological Survey and as set out in their 2008 Minerals Yearbook, “Titanium”, gross production of titanium mineral concentrates (ilmenite, rutile, and leucoxene) rose from 6.4 million tonnes in 2005 to an estimated 7.4 million tonnes in 2008. During the same period, published prices for high grade rutile were quoted at $500 - $725 per tonne f.o.b., depending on grade and whether the material was shipped in bulk or bagged. By comparison, in a recent publication by the U.S. Geological Survey titled Mineral Industry Surveys, “Titanium in the Third Quarter 2010”, January 2011 published prices for high grade rutile were quoted at $530 - $800 per tonne f.o.b. The following table sets forth the estimated world reserves of titanium minerals based upon global resources of titanium minerals. Mining of titanium minerals is usually performed using surface methods like dredging and dry mining and gravity spirals. Ilmenite is often processed to produce a synthetic rutile. The most widely used processes available for the manufacture of titanium dioxide pigment are the sulphate and chloride processes. Commercially manufactured titanium dioxide pigment is available as either anatase-type or rutile-type, categorized according to its crystalline form, regardless of whether it is made from the mineral rutile. Anatase pigment is currently made by sulphate producers only, while rutile pigment is made by both the chloride and the sulphate processes. The decision to use one process instead of the other is based on numerous factors, including raw material availability, freight, and waste disposal costs. Anatase and rutile pigments, while both are white, have different properties and thus have different end-uses. For example, rutile pigment is less reactive with the binders in paint when exposed to sunlight than is the anatase pigment and is preferred for use in outdoor paint. Anatase pigment has a bluer tone than rutile, is somewhat softer, and is used mainly in indoor paints and in paper manufacturing. Depending on the manner in which it is produced and subsequently finished, TiO2 pigment can exhibit a range of functional properties, including dispersion, durability, opacity, and tinting. In the chloride process, rutile is converted to TiCl4 by chlorination in the presence of petroleum coke. TiCl4 is oxidized with air or oxygen at about 900ºC, and the resulting TiO2 is calcined to remove residual chlorine and any hydrochloric acid that may have formed in the reaction. Aluminum chloride is added to the TiCl4 to assure that virtually all the titanium is oxidized into the rutile crystal structure. The process is conceptually simple but poses a number of significant chemical engineering problems because of the highly corrosive nature of chlorine, chlorine oxides and titanium tetrachloride at temperatures of 900°C or higher. In the sulphate process, ilmenite or titanium slag is reacted with sulfuric acid. Titanium hydroxide is then precipitated by hydrolysis, filtered and calcined. This is a process involving approximately 20 separate processing steps. Because sulphate technology is predominantly a batch process, it is possible to operate one part of a sulphate process plant while another part is shut down for maintenance. To some extent, stocks of intermediate reaction products can be allowed to build up, awaiting further processing downstream at some later time. It is also possible that a sulphate process plant can be run at 60-80% capacity utilization fairly easily if necessary, simply by switching off one or more of its calciners. Synthetic rutile is formed by removing the iron content from ilmenite, thereby concentrating the titanium dioxide content to at least 90%. In this way, ilmenites can be upgraded to chloride route feedstocks and used as a substitute for rutile. Figures in the U.S. Geological Survey’s 2008 Minerals Yearbook, “Titanium” show U.S. consumption of ilmenite and titaniferous slag by volume when taken together was approximately two times that of both natural and synthetic rutile. An assessment of historical data contained in the U.S. Geological Survey publication “Titanium Minerals Handbook, 1970 – 2007” shows that world demand for titanium dioxide pigments showed practically unbroken annual growth from 1.6 million tons in 1970 to 3.9 million tons in 2000. Demand declined to 3.7 million tons in 2001, rebounded to approximately 4.0 million tons in 2002 and steadily increased to approximately 4.9 million tons in 2007. Since 2007, demand for titanium pigment has continued to grow together with installed capacity. In their Mineral Commodity Summaries, “Titenium and Titanium Dioxide, January 2011” the U.S. Geological Survey estimate 2010 world titanium dioxide pigment capacity at 5.7 million tons. The U.S. Geological Survery Mineral Industry Surveys, “Titanium in the Third Quarter 2010, January 2011” published prices for bagged rutile mineral concentrates were quoted at $725 - $800 per tonne, up from $675- 725 quoted in the same period in 2008. By comparison, published prices for ilmenite concentrates in the third quarter or 2010 ranged from $65 - $85 per tonne down from $84 - $137 per tonne quoted in the same period in 2008. Once in production we will compete with a number of existing titanium dioxide concentrate producers, including Iluka Resources Inc., Richards Bay Iron and Titanium Pty. Ltd., QIT-Fer et Titane Inc., and Titania A/S as well as other projects proposed for development. Each of the existing producers has an operating history as well as proven reserves and resources; however the majority of their collective production is in the form of ilmenite or synthetic rutile, not natural rutile. Management believes that the location of the Cerro Blanco property may provide a significant advantage in competing with other producers of titanium. In addition to good road transport links, power and water, a port facility capable of handling 70,000 ton ships is available at Huasco, 30 kilometers northwest of the Cerro Blanco property. The property also lies close to a fully operational rail track, and if necessary, a spur line could be run into the property linking it directly to port facilities at Huasco. In order to be competitive, we will be required to meet buyers’ specifications, including particle size, concentration levels, calcium and impurities. Management believes metallurgical tests to date have demonstrated that the rutile mineralization at the Cerro Blanco concessions can be concentrated to an acceptable level to buyers. Results received in November 2006 of metallurgical mapping studies of the Cerro Blanco rutile deposit, which were based on 15 different samples selected from a recent RC drilling campaign, indicate that a high grade rutile product with low levels of calcium and other impurities can be produced from a range of ore types. Based on these earlier results, the Company has initiated work at the pilot plant level, to investigate critical engineering and commercial factors. The Company’s technical team, working with consultants, aims to process some 500 tonnes of Cerro Blanco ore in Chile to produce a commercial grade concentrate. Management does not currently have any customers for any rutile titanium which it may produce. We anticipate that the concentrate would be transported by ship which makes the location of the mining concessions near a port advantageous. Notwithstanding this, management will need to evaluate shipping rates and transit times when it obtains potential customers to determine whether existing prices for titanium would make sales to such customers economically viable. We have executed non-binding letters of intent with three prospective purchasers of our standard grade rutile concentrate. These letters of intent, which at this stage are non-binding on the parties and subject to the successful completion of a bankable feasibility study, are covered by a non-disclosure agreement. Mining, particularly copper mining is a significant industry in Chile. We will be competing with a number of existing mining companies, including the state-owned Codelco Copper Corporation, one of the world’s largest copper producers, for qualified workers, supplies, and equipment. However, management believes Cerro Blanco has an attractive location and good infrastructure in an active mining region. The property is located at a low elevation, near the coast, with two nearby towns from which it will be able to draw manpower and supplies. Our exploration activities are subject to extensive national, regional, and local regulations in Chile. These statutes regulate the mining of and exploration for mineral properties, and also the possible effects of such activities upon the environment. Future legislation and regulations could cause additional expense, capital expenditures, restrictions and delays in the development of the Cerro Blanco property, the extent of which cannot be predicted. Also, permits from a variety of regulatory authorities are required for many aspects of mine operation and reclamation. In the context of environmental permitting, including the approval of reclamation plans, we must comply with known standards, existing laws and regulations that may entail greater or lesser costs and delays, depending on the nature of the activity to be permitted and how stringently the regulations are implemented by the permitting authority. We are not presently aware of any specific material environmental constraints affecting the Cerro Blanco property that would preclude its exploration, economic development, or operation. Nevertheless, as a condition to placing the property into production, we are required to submit an environmental impact study for review and approval. Chile enacted provisions in its 1980 Constitution to stimulate the development of mining, while at the same time guaranteeing the property rights of both local and foreign investors. While the state owns all mineral resources, exploration and exploitation of these resources is allowed via mining concessions, which are granted by the courts. A Constitutional Organic Law, enacted in 1982, sets out that certain rights and obligations may attach to concessions, such as the right to mortgage or transfer concessions and the entitlement of the holder to explore (pedimentos) as well as to exploit (mensuras). A concession is obtained by filing a claim and includes all minerals that may occur within the area covered by the concession. The holder of a concession also has the right to defend his interest against the state and third parties. · Pedimento: A pedimento is an exploration claim precisely defined by coordinates with north-south and east-west boundaries. These may range in size from a minimum of 100 hectares to a maximum of 5000 hectares, with a maximum length-to-width ratio of 5:1. A pedimento is valid for a maximum period of two years, following which the claim may be reduced in size by at least 50%, and renewed for an additional two years, provided that no overlying claim has been staked. Claim taxes are due annually in the month of March; if the taxes on a pedimento are not paid by such time, the claim can be restored to good standing by paying double the annual claim tax by or before the beginning of the following year. In Chile, new pedimentos are permitted to overlap pre-existing claims; however, the previously staked or underlying claim always takes precedence as long as the claim holder maintains his claim in good standing and converts the pedimento to a manifestacion within the initial two year period. · Manifestacion: During the two-year life of a pedimento, it may be converted at any time to a manifestacion. Once an application to this effect has been filed, the claim holder has 220 days to file a “Solicitud de Mensura”, or “Request for Survey” with a court of competent jurisdiction, and notify surrounding claim holders of the application by publishing such request in the Official Mining Bulletin. This notifies surrounding claim holders, who may contest the claim if they believe their pre-established rights are being encroached upon. The option also exists to file a manifestacion directly on open ground, without going through the pedimento filing process. Each of the above stages of the acquisition of a mining claim in Chile requires the completion of several steps, including application, publication, inscription payments, notarization, tax payments, legal fees, “patente” payments, and extract publication, prior to the application being declared by the court as a new mineral property. Details of the full requirements of the claim staking process are documented in Chile’s mining code. Most companies carrying on operations in Chile retain a mining claim specialist to carry out and review the claim staking process and ensure that their land position is kept secure. In 1994 Chile adopted legislation establishing general environmental norms which must be followed in activities such as mining. This legislation requires us to prepare an environmental impact study which must include a description of the project and a plan for compliance with the applicable environmental legislation. It must also include base line studies containing the information relative to the current components of the existing environment in the area influenced by the project. Further, it must consider the construction, operation and closure/abandonment phases of the project. It must also include a plan to mitigate, repair, and compensate, as well as risk prevention and accident control measures, to achieve a project compatible with the environment. The study must be presented to the community for comment and to the regional arm of the National Environmental Commission for approval. We have completed an environmental base line study on the property, which has not yet been submitted to the regional Chilean government authority for review and approval. The work completed to date will form the basis of the environmental impact study to commence mining operations. While the environmental monitoring and base line studies completed to date have not identified any endangered plant or animal species on the property, and while the property is located at distance from human habitation, these studies cited a risk of airborne dust being generated from rock blasting and crushing operations and from road haulage activities at open pit mining operations. Without proper blasting, crushing and road maintenance practices in place, there is a risk that airborne dust generated from the planned mining activity at Cerro Blanco could be transported by winds to the village of Nicolasa, located approximately 14 kilometers to the northeast, or onto farmland located within the Huasco River valley to the north-northeast. Nevertheless, prevailing winds at the mine site are east-west which should permit us to schedule blasting and other activities which create significant dust on days with prevailing or no winds. Our principal rock crushing plant will be fitted with dust containment units which should also mitigate dust from these activities. We also plan to use water trucks to dampen roadways and limit the amount of dust from trucks using these roads. Commercial production of titanium metal using the Chinuka Process and feed stock derived from the Cerro Blanco project within nine years after closing. The Chinuka Process was developed under the direction of Dr. Derek Fray, Professor and Director of Research, Materials Science and Metallurgy, University of Cambridge, UK. Unlike the industry-standard, multi-step Kroll batch process which uses titanium pigment as a feed stock to produce titanium sponge metal, the Chinuka Process is essentially a one-step process and uses titanium ores and concentrates as a feed stock. By replacing a multi-step process with a process in which refining and electro-deposition take place simultaneously and substituting ores and concentrates as a feed stock, the Chinuka Process holds forth potentially significant cost and production time saving over the Kroll process. We anticipate the sublicensing of the Chinuka Process will create an opportunity to add value to the Cerro Blanco project, particularly with respect to the planned minus 53 micron titanium concentrate product. In the first quarterly progress report since licensing a new titanium metal technology in September, 2010, we were advised that lab scale test work continued at the University of Cambridge in the UK under the direction of Professor Derek Fray into the refining and electrolytic deposition of pure titanium from lower grade concentrate. Small quantities of sponge were successfully produced using Ultra-fine concentrate feedstock sourced from the Company’s Cerro Blanco project in Chile. The focus for the research has now shifted to an investigation of the possibility of adapting the new technology to produce titanium metal powder, a higher value product than sponge. Consideration will also be given to testing lower grade concentrate as a feedstock for the new metal technology; feedstock of a quality that would not normally find application for use in the production of titanium pigment, currently the major outlet for titanium concentrates. We are very encouraged by the results to date of the new metal technology. Should we continue to have success with this technology at a lab scale, we may consider building a pilot plant to scale up the test work. We maintain property and general liability insurance with coverage we believe is reasonably satisfactory to insure against potential covered events, subject to reasonable deductible amounts, through our exploration stage. Aside from our President, Michael P. Kurtanjek, who works full time for our company, and our directors and executive officers that donate a portion of their time to our business, we currently have only one other full-time employee who works as our office manager in Santiago. With the funds from this offering, we intend to hire an on-site full-time manager for the Cerro Blanco project. We will also be dependent upon the services of outside geologists, metallurgists, engineers, and other independent contractors to conduct our drilling program, develop our pilot plant, and conduct the various studies required to complete exploration of our mining concessions. In addition, we do not have any agreements or arrangements for the necessary managers and employees who will be necessary to operate the mine if commercial production commences. We do not have any existing contracts for these services or employees. We have not received written comments from the staff of the Securities and Exchange Commission in regard to our periodic or current reports under the Exchange Act which comments remain unresolved. Through our Chilean subsidiary we hold mining concessions for 33 registered mining exploitation concessions, and 5 exploration concessions, over approximately 8,225 hectares in Chile. We are in the exploration stage, which means we are engaged in the search for mineral deposits or reserves which could be economically and legally extracted or produced. We are conducting a drilling campaign and pre-feasibility work in preparation for a feasibility study to determine whether the concessions contain commercially viable ore reserves. If we are successful in obtaining a feasibility study which supports commercially viable ore reserves, we intend to exploit the concessions and to produce titanium dioxide concentrate through conventional open pit mining and minerals processing. Our business plan is to explore solely for titanium deposits or reserves on the Cerro Blanco mining concessions. ALKALIC DIORITE-GABBRO-PYROXENITE INTRUSIVE: a potassium and sodium rich, coarse grained and possibly dark colored igneous rock with associated magnesium and iron that consolidated from magma beneath the earth's surface. DEVELOPMENT: work carried out for the purpose of opening up a mineral deposit and making the actual extraction possible. DISSEMINATED: fine particles of mineral dispensed through the enclosing rock. EXPLOITATION MINING CONCESSIONS: licensed claims where the holder has the right to permit, develop, and operate a mine. EXPLORATION: work involved in searching for ore by geological mapping, geochemistry, geophysics, drilling and other methods. GRADE: mineral or metal content per unit of rock or concentrate or expression of relative quality e.g. high or low grade. INTRUSIVE: a volume of igneous rock that was injected, while still molten, and crystallized within the earth’s crust. MINERALIZATION: the concentration of metals and their compounds in rocks, and the processes involved therein. ORE: material that can be economically mined from an ore body and processed. RECLAMATION: the restoration of a site after exploration activity or mining is completed. RUTILE: a mineral, titanium dioxide (TiO2), trimorpheus with anatase and brookite. TiO2: Titanium dioxide. The form of titanium found in the mineral rutile. TITANIUM: a widely distributed dark grey metallic element, (Ti), found in small quantities in many minerals. The mineral ilmenite, (FeTiO3), is currently the principal feedstock for the production of titanium dioxide (TiO2) powder and titanium metal. The Cerro Blanco property is located approximately 39 kilometers, or approximately 24 miles, west of the city of Vallenar in the Atacama geographic region (Region III) of northern Chile and southwest of the Cerro Rodeo Mining District. Access to the property is as follows: The main Ruta 5, the PanAmerican Highway, runs north from Santiago for approximately 625 kilometers to Vallenar; from there a paved road runs west toward the Port of Huasco for a distance of 22 kilometers to the village of Nicolasa; at Nicolasa a municipally maintained dirt road runs approximately 14 kilometers southwest to the property. Management believes access to the property is adequate to accommodate the type of vehicles and traffic during the exploration stage on the property. Improvements to the dirt road will be required for the development and production stages. These improvements will include widening of the road and topping it with gravel. Management believes adequate supplies of bedrock and gravel are available for this purpose, although it currently has no arrangements or agreements to provide either the improvement services or supplies. The area is served by a regional airport at Vallenar. Cerro Blanco lies within an established mining district where management believes experienced mineworkers and support personnel are available. Labor rates in the region are considerably less costly when compared with standard North American rates. Mining is one of the main sectors of the Chilean economy and Region III has a broad base of mining contractors and suppliers of both new and used mining and processing equipment. The local climate is generally arid with little rainfall in normal years. Vegetation is minimal, supporting only desert scrub and sparse cactus. Topography consists of low hills with a mean elevation of 100 meters, which are incised periodically by active creeks. The Huasco River, 15 kilometers, approximately 9 miles, to the north, is a source of water. Additionally, high-tension power lines pass 15 kilometers, approximately 9 miles, to the north of the property along the Vallenar-Huasco highway. In addition to road transport links, power and water access, a port facility with a capacity to handle 70,000 ton ships is accessible at Huasco, which is 30 kilometers, approximately 19 miles, northwest of the property. The property also lies close to a fully operational rail track. If necessary, a spur line could be run into the property linking it directly to the port. Under the Chilean mining code, surveyed mineral concessions can be held in perpetuity subject only to an annual tax based on the land held. We have converted our existing exploration licenses into 33 exploitation licenses. The tax payment for March 2008 was approximately $55,000 based upon the status of the mining concessions and the currency exchange rate at that time. The payment for March 2009 and 2010 was $55,000 and $78,400 at the prevailing exchange rate. We estimate that the amount for 2011 will be $78,400. The Chilean mining code does not convey surface rights to owners of the mining concessions. However, the owners of mining concessions are entitled to the establishment of the necessary easements for mining exploration and exploitation. The surface lands are subject to the burden of being occupied, to the extent required by mining operations, by ore yards and dumps, slag and tailings, ore extraction and benefaction plants, electric substations and communications lines, canals, reservoirs, piping, housing, construction and supplementary works, and to the encumbrance of transit and of being occupied by roads, railways, piping, tunnels, inclined planes, cableways, conveyor belts and all other means used to connect the operations of the concession with public roads, benefaction facilities, railroad stations, shipping ports, and consumer centers. The establishment of these easements, the exercise thereof, and the compensation therefore, are to be agreed upon either between the concession owner and the surface owner, or are established by court decision under a special brief procedure contemplated by the law. The surface rights are owned by Agrosuper, a large Chilean agricultural concern.. Upon completion of the final feasibility study, we intend to either negotiate surface rights with Agrospuper or to apply to local courts for these surface rights. This is an ongoing progress. Nevertheless, should this alternative fail, we will proceed to seek the easement through the court, which under Chilean mining law we have the right to obtain. We do not anticipate any material difficulty with surface rights on the Cerro Blanco property. In 1990-1991, the western half of the property, then referred to as Barranca Negra, was held under option by Adonos Resources of Toronto, Canada, who conducted extensive rock sampling, geological mapping and 450 meters of trenching. In 1992 the property was optioned by Phelps Dodge, to which they applied the name Freirina. In late 1992 and early 1993, 1,200 meters of diamond and 6,000 meters of reverse circulation drilling were completed, principally in the most westerly Cerro Blanco anomaly. In 1993 two 15 ton bulk samples were taken for metallurgical testing. A gravity concentrate was produced from a 15 ton sample of this material by Lakefield Research in Santiago. Fifty kilos of this concentrate were shipped to Carpco Inc. in Florida for further gravity circuit up-grading followed by dry-milling using magnetic and electrostatic separation techniques. In 1999, Dorado Mineral Resources N.L. purchased the property and re-named the property Celtic. In February 2000, a preliminary processing test carried out by RMG Services Pty. Ltd., Adelaide, Australia, on behalf of Dorado, used combined microwave leaching and flotation in the up-grading of Celtic (Freirina) gravity concentrate. In June 2000 a review and summary of prior exploration programs and results was conducted by an independent geological consultant on behalf of Dorado Mineral Resources N.L. A cross-sectional estimation of the resource potential of the Cerro Blanco deposit based on the prior drilling and surface sampling was completed as part of this study. Later the same month a scoping study based on level plans produced for the area of highest density drilling was undertaken on behalf of Dorado Recursos Minerales Chile S.A. by Tecniterrae Limitada, a Santiago based group of consulting mining engineers. In November and December 2000 a further study was commissioned by Dorado Recursos Minerales Chile S.A. to supervise the collection of a second bulk sample of 25 tons for metallurgical testing. Also during this program the Cerro Blanco area was geologically re-mapped. In August 2001, ownership of the property was transferred to Kinrade Resources Limited. Subsequent to these events, Kinrade defaulted on its obligations and was unable to meet the payment schedules as required under contract. In the fall of 2003 ownership of the property passed to Sociedad Contractual Minera White Mountain Titanium, formerly known as Compañía Minera Rutile Resources Limitada, the wholly owned subsidiary of White Mountain Titanium Corporation. The purchase was completed in September 2005. Management believes the Cerro Blanco property contains a large and possibly unique type of titanium mineralization. Nevertheless, we are still in the exploration stage of development and there are no known reserves on the property. The titaniferous mineral located on the property is clean red-brown and black rutile which occurs disseminated with the tonalitic suite of an alkalic diorite-gabbro-pyroxenite intrusive. Its uniformly disseminated nature and associated alteration endow it with strong similarities to porphyry copper deposits. Natural rutile concentrates such as found on this property would be the preferred feed stock for both titanium metal and pigment grade titanium dioxide production. During 2006, we undertook two separate drilling campaigns. The first was designed to test ore variability, and provided 15 different composites which were subjected to metallurgical testing. The second campaign, which commenced in October 2006, centered on an exploration program consisting mainly of infill and step out drilling, grade variability studies and regional reconnaissance in search of possible extensions to the mineralization and geologic modelling. On January 24, 2007, we announced that we had completed a 16-hole diamond drilling campaign, totaling over 2,900 meters at Cerro Blanco. The principal objectives of this campaign were to increase resources in the central portion of the main zone as well as to test new target areas to the south and south-west. Core recoveries in excess of 95% were achieved in the majority of holes drilled. Split core samples were sent in for on-going metallurgical testing, and whole-core geotechnical testing has been carried out in respect of rock mechanics for mine planning purposes. Planning and execution of the drilling campaign was closely linked to previous metallurgical test work. The principal focus was to target titanium resources which would yield a high grade TiO2 concentrate from conventional flotation. After an extensive evaluation of historic data, our contract geologists devised and are now utilizing an ore ranking system, MR1 (“Mine Rank 1”) through to MR4, with ranks MR1 and MR2 producing the best, and most commercially acceptable chemical product specifications. Data from the latest drilling campaign was input into a geological model and this model, together with ongoing technical work, will be integrated into a resource model. Titanium mineralization starts at surface and extends over long intercepts with both attributes offering the potential for low mining costs. We believe we have good results in the central portion of the main zone of Cerro Blanco, as well as significant potential for further resource development to the south and south-west areas of the property. During 2007, the Company’s geological team undertook and extensive geochemical sampling program at the Eli prospect. Working on a 25 by 25 meter grid, the team took nearly 700 samples of outcrop material over an area of 1100 meters by 900 meters. These were sent for chemical assay. Samples showed mineralization with TiO2 grades in the range 1.0% to 3.0%; two samples from high grade vein material reported results in excess of 21% TiO2 and 25% TiO2, respectively. In early 2008 the Company built a 12 kilometer, 5 meter wide access road to and around Eli. Drill pads were constructed on 50 meter centers adjacent to the road grid covering the prospect. An initial drill program, which involved two diamond drill rigs, commenced in late April and ran through June. Approximately 4,000 meters of drilling was completed. The Company is awaiting final analyses and a compilation report on the program. In January 2008 the Company retained Thomas A. Henricksen, PhD. and a qualified person under Canadian National Instrument 43-101 to prepare a NI 43-101 compliant technical report on the Cerro Blanco property (the “Technical Report”). The Technical Report, which was dated February 25, 2008, was based on extensive geological mapping, surface sampling, 14,078 meters of drilling and a geological model developed by the Company. Following completion of the Technical Report, the Company retained Dr. Henricksen to compile a NI 43-101 compliant preliminary assessment of the Cerro Blanco project (the “Assessment”). The Assessment, which was dated May 30, 2008, incorporated by reference the Technical Report as well as reports prepared for the Company by other independent experts in their fields. The latter reports include preliminary process engineering and costing report prepared by AMEC-Cade dated March, 2008, a preliminary pit design report prepared by NCL Ingenieria y Construccion dated May 2008, various metallurgical reports prepared by SGS Lakefield, an environmental base line study prepared by Arcadis Geotecnica dated December 2004 and titanium marketing information provided by the Company’s marketing consultant. For engineering design purposes, the Assessment adopted a base case set of assumptions, the major assumptions being the construction of an open pit mine, processing plant and ancillary facilities capable of producing 100,000 tonnes per year of high grade rutile concentrate grading plus 94.5% TiO2 at start up, scaling to 130,000 tonnes per year in production Year 4 at an assumed undiluted head grade to the plant of 2.3% TiO2. Mining would commence on the Las Carolinas prospect and feed would be conveyed downhill to a processing plant located less than two kilometers to the northeast. Within the plant, the process flow sheet consisted of a semi-autogenous grinding mill, gravity pre-concentration and column flotation circuits and high intensity magnetic separation with process water sourced from a desalination plant constructed at the port of Huasco. AMEC-Cade assumed that mining would be done under contract at a cost of US$1.20 per tonne mined and that the price of high grade rutile concentrates would be US$500 per tonne FOB port. Based on these assumptions AMEC-Cade, our internationally recognized engineering contractor, designed a processing plant with an initial operating capacity of approximately 5.1 million tonnes per year, increasing to approximately 6.1 million tonnes per year by Year 4. They estimated a cost to construct the plant and ancillary facilities of US$117 million in direct costs and US$42 million in indirect costs, for a total of US$159 million. To this figure, and as this was a preliminary study, AMEC-Cade added a 20% contingency to arrive at a total estimated cost of US$190 million. With respect to processing plant operating costs, AMEC-Cade estimated site and transportation costs to port of US$3.60 per tonne processed (US$184 per tonne of rutile concentrate) in Year 1, dropping to US$3.50 per tonne processed (US$180 per tonne of rutile concentrate) in Year 4. The anticipated reduction in operating costs is attributed to increased volumes as well as increased efficiencies from the gravity pre-concentration circuit. Electric power consumption was the highest single cost item, comprising approximately 31% of the total estimated unit operating costs. AMEC-Cade recommended that the Company proceed to the pilot stage and investigate two possibilities for reducing capital costs: the use of sea water rather than desalinated water in the processing plant and siting the plant elsewhere on the property to lower the installed cost of the conveyor. Two alternate sites were identified. In December 2009 we announced completion of a detailed Stage 2 pilot plant test work program culminating in one 60 hour continuous test run. The primary objective of the Stage 2 pilot plant test work was to produce a natural rutile, titanium dioxide concentrate meeting the chemical and particulate specifications of titanium pigment and sponge metal producers. The test work was conducted on a 275 tonne bulk sample representative of currently identified, at and near surface natural rutile mineralization sourced from the Las Carolinas prospect at our Cerro Blanco project. The bulk sample, which was taken from an area of the Las Carolinas prospect which could be chosen to provide initial mine feed to a full scale process plant, assayed 2.9% TiO2. Following crushing to minus ½ inch, mill underflow was fed to a gravity pre-concentration circuit which consisted of a fine fraction recovery cyclone as well as middlings and coarse fraction mechanical vibrating tables. The mechanical vibrating tables concentrated the higher specific gravity, natural rutile while rejecting some 50% by volume of the lower specific gravity feed material. The result of gravity pre-concentration was to upgrade the natural rutile being processed from an initial grade of 2.9% TiO2 to a grade of approximately 5.0% TiO2. Upgraded material from the gravity pre-concentration circuit was fed to a conditioning tank for pH adjustment and from there to a conventional flotation circuit for further recovery, concentration and cleaning. Flotation feed from the conditioning tank was passed to rougher, scavenger and 5 cleaning flotation stages, where the majority of the natural rutile was recovered and concentrated. An acid pH in the flotation circuit between 3.5 and 4.75 was maintained in the flotation circuit. Tailings from the flotation circuit could form the feed source for a feldspar recovery circuit. Following the final flotation cleaning stage, the natural rutile, titanium dioxide concentrate was fed to a high intensity magnetic separator to remove magnetic and para-magnetic minerals. Magnetic separation resulted in two concentrate products: a high grade natural rutile, titanium dioxide concentrate and a magnetic and para-magnetic minerals by-product concentrate. Following completion of the Stage 2 pilot plant test work, we conducted further optimization test work on the rutile process flow sheet, specifically the use of spirals and Knelson concentrators in the gravity pre-concentration circuit and the use of sea water as the aqueous medium in the flotation circuit. In January 2010 we released results from this optimization test work which stated that spirals were a viable alternative to mechanical vibrating tables in the pre-concentration circuit and that comparable concentrate grades and recoveries were obtained using sea water versus fresh water as the aqueous medium in the flotation circuit. Also in January 2010 we reported that we had successfully completed a locked cycle, flotation test work program to recover feldspar from natural rutile (titanium dioxide) flotation tailings. All test work was carried out in an acidic environment (pH 3.5 to 5.5)—very similar to pH conditions previously used in the flotation of rutile. Management believes this is an important achievement as it obviates the need to undertake major pH adjustment from the rutile to the feldspar flotation circuit. A sodium feldspar concentrate assaying 9.07% Na2O and 0.37% Fe2O3 was produced using fresh water as the aqueous medium and minimal addition of flotation reagents. As with the natural rutile, titanium dioxide concentrate results achieved in the optimization test work, comparable sodium feldspar concentrate grades were obtained using sea water versus fresh water as the aqueous medium. With respect to mining, mining costs would be in addition to the processing plant operating costs estimates set out above. A preliminary mine plan will be prepared once further drilling has been completed. At present NCL have modeled preliminary optimized pits for only the Central Zone of the Las Carolinas prospect on the assumption that this could be the initial pit area. The pits were modeled using 10 x 10 x 10 meter blocks and base case pit wall angles of 45 degrees, with sensitivities run at 50 degrees. 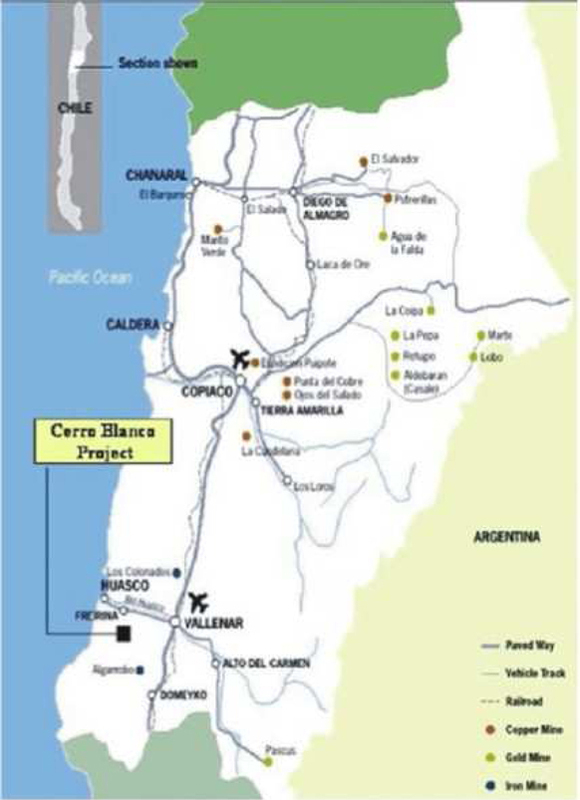 Whilst the objective of our mapping, surface sampling and drilling programs is to both increase the quantity and classification of TiO2 resources on the Cerro Blanco property, the project is at an exploration stage and there is no guarantee of future exploration success or of economic viability. For these reasons, project cash flow estimates are not included in the Assessment. Arcadis Geotecnica conducted an environmental base line study in 2005 -2006 over the Las Carolinas and La Cantera prospects. Based on field information gathered, vegetation in the area was comprised mostly of bushes, cactus and plants characteristically found in desert regions and areas of sandy and stony soils. Whilst no native animals were observed, animals potentially living in the area would include foxes, rodents, pumas, guanacos, rabbits and reptiles. The study stated that a mining operation as contemplated would have no significant impact on land vertebrates but care would need to be exercised on the northern slopes favored by reptiles. Six underground springs were identified, several with only seasonal flow. As well six houses were observed extending from the project north towards Vallenar, three of which are occupied on a permanent basis. Conversations with the inhabitants suggested that they would have a positive view of the project due to the economic and social benefits it would bring. Arcadis Geotecnica recommended an intensive follow up survey of one ravine for possible archaeological relics and indentified two areas for the possible stockpiling of waste rock. We retained Arcadis Geotechnica to complete the recommended follow up survey and no archaeological relics were found. The Assessment concluded that results from the considerable body of work completed on the project to date support the our recommended, phased work programs and that the estimated costs for the work programs were reasonable and adequate to the present stage of the project. The overall objective of our work programs is to complete an independent final feasibility study which supports the construction of a natural rutile, TiO2 mining operation on the property. On July 7, 2010 we reported that road building and drill pad construction had been completed at the Las Carolinas prospect in readiness for a 7,500 meter diamond drilling program. The objective of the drilling program was to upgrade sufficient of the current resource to a measured and indicated classification to support a 5 - 6 million tonne per year mining operation for 20 years. On September 27, 2010 we announced that preparations had commenced for the start of the final engineering feasibility study (“Final Feasibility”) at the Cerro Blanco titanium project, previous project milestones relating to geology, geologic resources, metallurgy, pilot plant test work resulting in production of commercial grade titanium dioxide concentrates and a preliminary economic assessment have been achieved. The remaining milestones to be achieved to take the project to Final Feasibility include in-fill and step out drilling at the Las Carolinas prospect; processing test work to enhance the product specifications for a planned sodium feldspar concentrate; an environmental impact study; a definitive engineering and economic assessment of the proposed mine and associated titanium / feldspar processing plant; operating permits, process water and surface access rights. Work on the first of these, the drilling milestone, is underway. At the Las Carolinas prospect the Company’s geological staff has completed access roads to 50 new drill pads. The drilling at Las Carolinas will total approximately 7,500 meters, comprised of 50 diamond drill holes. This drilling, typically to an average depth of 150 metres, is designed to reclassify more of the established geologic resources to the measured and indicated categories with the objective of having sufficient ore to sustain a mining operation for 20 years. This drill work is scheduled to be completed by April 2011 and the results will be incorporated into final pit design(s) and mine scheduling. Arcadis Geotecnica, White Mountain’s environmental consultant, has been contracted to complete a baseline monitoring update over approximately half of the project’s land area in preparation for the commissioning of a full Environmental Impact Study (EIS). Arcadis’ field personnel will be updating work that was carried out in 2006. They will consider the environmental impact of the proposed mining operation on indigenous flora and fauna and local communities. In addition and as part of their mandate, Arcadis will work with Company personnel to plan and implement the necessary project permitting process, including legal requirements for final site remediation. The Company has commenced discussions with the surface rights holder to the Cerro Blanco project to establish a mutually acceptable access corridor to the mine site. In addition to road traffic, it is envisaged that this corridor would also be used to bring line power and process water to site. On December 21, we announced that we had signed a contract with SGS Lakefield (“SGS”) to conduct a further process development program for the recovery of high purity sodium feldspar concentrate from the Cerro Blanco Project. The objective of this program is to refine and optimize the sodium feldspar process flowsheet and to enhance overall concentrate specifications. Working on a feedstock derived from the tailings stream of earlier rutile pilot plant testwork, SGS will examine the selective use of flotation activators and collectors and the effect of varying process conditions on the recovery of a high purity, sodium feldspar concentrate to a specification suitable for use in glass and ceramics applications. From a metallurgical perspective, findings from this process development program will add to the considerable body of Project information that already exists concerning the recovery of co-product feldspar. From a commercial point of view, samples of the resultant concentrate will be made available to several international industrial mineral companies who have expressed a possible interest in purchasing sodium feldspar concentrate produced from the Project. We now have a considerable body of engineering design and process engineering work completed, both by us and previous owners, for the development of a large open pit mine and milling operation. We believe a feasibility study could be completed by December, 2011. We estimate the cost to take the project to the point of completing a final engineering feasibility study at approximately $2.76 million, including general and administrative and marketing expenses. Also, as an exploration stage company, our work is highly speculative and involves unique and greater risks than are generally associated with other businesses. We cannot know if our mining concessions contain commercially viable ore bodies or reserves until additional exploration work is done and an evaluation based on such work concludes that development of and production from the ore body is technically, economically, and legally feasible. If we proceed to development of a mining operation, our mining activities could be subject to substantial operating risks and hazards, including environmental hazards, industrial accidents, labor disputes, encountering unusual or unexpected geologic formations or other geological or grade problems, encountering unanticipated ground or water conditions, pit-wall failures, flooding, rock falls, periodic interruptions due to inclement weather conditions or other unfavorable operating conditions and other acts of God. Some of these risks and hazards are not insurable or may be subject to exclusion or limitation in any coverage which we obtain or may not be insured due to economic considerations. From time to time, we may become involved in various lawsuits and legal proceedings, which arise in the ordinary course of business. However, litigation is subject to inherent uncertainties, and an adverse result in these or other matters may arise from time to time that may harm our business. We are currently not aware of any such legal proceedings or claims that we believe will have, individually or in the aggregate, a material adverse affect on our business, financial condition or operating results. Our common stock is quoted on the OTC Bulletin Board and on the Pink Sheets under the symbol “WMTM.” The table below sets forth for the periods indicated the range of the high and low bid information as reported by a brokerage firm, as reported on the Internet, and/or as reported by the Pink Sheets. These quotations reflect inter-dealer prices, without retail mark-up, mark-down, or commission and may not necessarily represent actual transactions. At March 3, 2011, we had approximately 115 record holders of our common stock. The number of record holders was determined from the records of our transfer agent and does not include beneficial owners of common stock whose shares are held in the names of various security brokers, dealers, and registered clearing agencies. We have appointed Interwest Transfer Company, Inc., 1981 East 4800 South, Suite 100, Salt Lake City, UT 84117, to act as the transfer agent of our common stock. We have no equity securities registered pursuant to Section 12 of the Exchange Act. On January 18, 2011, we entered into a Rights Agreement (the “Rights Agreement”), dated January 18, 2011, between us, our transfer agent, Interwest Transfer Company, Inc., as Rights Agent (the “Rights Agent”). In connection with the adoption of the Rights Agreement, effective January 18, 2011, the Board of Directors declared a dividend distribution of one right (“Right”) for each outstanding share of our common stock, payable to stockholders of record on January 28, 2011. Each Right, when exercisable, entitles the registered holder to purchase from us one one-thousandth of one share of Series B Junior Participating Preferred Stock (“Preferred Stock”) at a price of $4.00 per one one-thousandth share (the “Purchase Price”), subject to adjustment. Initially, the Rights will be attached to all certificates representing shares of our common stock then outstanding, and no separate certificates evidencing the Rights will be distributed. The Rights will separate from our common stock and a distribution of Rights Certificates (as defined below) will occur upon the earlier to occur of (i) 10 days following a public announcement that a person or group of affiliated or associated persons (an “Acquiring Person”) has acquired beneficial ownership of 15% or more of the outstanding shares of our common stock (the “Stock Acquisition Date”) or (ii) 10 business days (or such later date as the Board of Directors may determine) following the commencement of, or the first public announcement of the intention to commence, a tender offer or exchange offer the consummation of which would result in the beneficial ownership by a person of 15% or more of the outstanding shares of our common stock (the earlier of such dates being called the “Distribution Date”). Until the Distribution Date, (i) the Rights will be evidenced by our common stock certificates, and will be transferred with and only with the common stock certificates, (ii) new stock certificates issued after January 28, 2011, upon transfer or new issuance of our common stock will contain a notation incorporating the Rights Agreement by reference, and (iii) the surrender for transfer of any certificates for shares of our common stock outstanding will also constitute the transfer of the Rights associated with the common stock represented by such certificate. The Rights are not exercisable until the Distribution Date and will expire at the close of business on January 18, 2021, unless such date is extended, the Rights Agreement is terminated, or the Rights are earlier redeemed or exchanged by us as described below. The Rights will not be exercisable by a holder in any jurisdiction where the requisite qualification to the issuance to such holder, or the exercise by such holder, of the Rights has not been obtained or is not obtainable. As soon as practicable following the Distribution Date, separate certificates evidencing the Rights (“Rights Certificates”) will be mailed to holders of record of our common stock as of the close of business on the Distribution Date and, thereafter, the separate Rights Certificates alone will evidence the Rights. Except as otherwise determined by the Board of Directors, only shares of our common stock issued prior to the Distribution Date will be issued with Rights. In the event that a person becomes the beneficial owner of 15% or more of the then outstanding shares of our common stock, except pursuant to an offer for all outstanding shares of our common stock which the Board of Directors determines to be fair to and otherwise in the best interests of our company and its stockholders (a “Qualifying Offer”), each holder of a Right will, after the end of a redemption period referred to below, have the right to exercise the Right by purchasing, for an amount equal to the purchase price, common stock (or, in certain circumstances, cash, property or other securities of our company) having a value equal to two times such amount, provided that the per share value of the common shares shall not be less than the applicable exercise price of warrants issued pursuant to the Securities Purchase Agreement dated July 7, 2005, as amended, with Rubicon Master Fund, which exercise price is currently $0.50 per share. Notwithstanding any of the foregoing, following the occurrence of the events set forth in this paragraph, all Rights that are, or (under certain circumstances specified in the Rights Agreement) were, beneficially owned by any Acquiring Person will be null and void. However, Rights are not exercisable following the occurrence of the events set forth above until such time as the Rights are no longer redeemable by us as described below. For example, at a Purchase Price of $4.00 per Right, each Right not owned by an Acquiring Person (or by certain related parties) following an event set forth in the preceding paragraph would entitle its holder to purchase $8.00 worth of our common stock (or other consideration, as noted above) for $4.00. Assuming that our common stock had a per share value of $2.00 at such time, the holder of each valid Right would be entitled to purchase four shares of our common stock for $4.00. In the event that at any time following the Stock Acquisition Date, (i) we are acquired in a merger or other business combination transaction (other than a merger that follows a Qualifying Offer), or (ii) 50% or more of our assets or earning power is sold or transferred, each holder of a Right (except Rights which previously have been voided as described above) shall, after the expiration of the redemption period referred to below, have the right to receive, upon exercise, common stock of the acquiring company having a value equal to two times the Purchase Price of the Right (e.g., common stock of the acquiring company having a value of $8.00 for the $4.00 Purchase Price). At any time after a person or group of affiliated or associated persons becomes an Acquiring Person and prior to the acquisition by such person of 50% or more of the outstanding shares of our common stock, the Board of Directors may exchange the Rights (other than Rights owned by such person or group which have become void), in whole or in part, at an exchange ratio of one share of our common stock (or, in certain circumstances, other equity securities of our company that are deemed by the Board of Directors to have the same value as shares of our common stock) per Right (subject to adjustment). The Purchase Price payable, and the number of one one-thousandths of a share of Preferred Stock or other securities or property issuable, upon exercise of the Rights are subject to adjustment from time to time to prevent dilution under certain circumstances. With certain exceptions, no adjustment in the Purchase Price will be required until cumulative adjustments require an adjustment of at least 1% in such Purchase Price. No fractional shares will be issued (other than fractions which are integral multiples of one one-thousandth of a share of Preferred Stock) and in lieu thereof, an adjustment in cash will be made based on the market price of the Preferred Stock on the last trading date prior to the date of exercise. In general, the Board of Directors may redeem the Rights in whole, but not in part, at any time during the period commencing on January 18, 2011, and ending on the tenth business day following the Stock Acquisition Date (the “Redemption Period”) at a price of $0.001 per Right (payable in cash, common stock or other consideration deemed appropriate by the Board of Directors). Under certain circumstances set forth in the Rights Agreement, the decision to redeem the Rights will require the concurrence of a two-thirds majority of the Board of Directors. After the Redemption Period has expired, our right of redemption may be reinstated if an Acquiring Person reduces his beneficial ownership to 10% or less of the outstanding shares of our common stock in a transaction or series of transactions not involving us and there are no other Acquiring Persons. Immediately upon the action of the Board of Directors ordering redemption of the Rights, the Rights will terminate and the only right of the holders of Rights will be to receive the $0.001 redemption price. Until a Right is exercised, the holder thereof, as such, will have no rights as a stockholder of our company, including, without limitation, the right to vote or to receive dividends. While the distribution of the Rights will not be subject to federal taxation to stockholders or to us, stockholders may, depending upon the circumstances, recognize taxable income in the event that the Rights become exercisable for common stock (or other consideration) of our company or for common stock of the acquiring company as set forth above. We currently have outstanding warrants to purchase up to 4,250,000 shares at a current exercise price of $0.50 per share. These warrants are held by Rubicon Master Fund pursuant to the Securities Purchase Agreement dated July 7, 2005, as amended. Pursuant to the terms of this warrant, the warrant holder will be entitled to the same rights as a shareholder under the Rights Agreement as if the warrant were exercised. Except with respect to the Redemption Price of the Rights, any of the provisions of the Rights Agreement may be amended by the Board of Directors prior to the Distribution Date. After the Distribution Date, the provisions of the Rights Agreement may be amended by the Board of Directors in order to cure any ambiguity, defect or inconsistency or to make changes which do not adversely affect the interests of holders of Rights (excluding the interests of any Acquiring Person), or to shorten or lengthen any time period under the Rights Agreement; provided however, no amendment to adjust the time period governing redemption may be made at such time as the Rights are not redeemable. A total of 500,000 shares of Preferred Stock are reserved for issuance upon exercise of the Rights. The Rights have certain anti-takeover effects. The Rights will cause substantial dilution to a person or group that attempts to acquire our company without conditioning the offer on a substantial number of Rights being acquired, or in a manner or on terms not approved by the Board of Directors. The Rights, however, should not deter any prospective offeror willing to negotiate in good faith with the Board of Directors, nor should the Rights interfere with any merger or other business combination approved by the Board of Directors. At least once every three years the Audit Committee of the Board of Directors or a committee of directors comprised of directors who are independent of management and free from any relationship that, in the opinion of the Board of Directors would interfere with their exercise of independent judgment, shall review and evaluate the Rights Agreement in order to consider whether the maintenance of the Rights Agreement continues to be in our interests and our stockholders. Following each such review, the committee will communicate its conclusions to the full Board of Directors, including any recommendation in light thereof as to whether the Rights Agreement should be modified or the Rights should be redeemed. We recorded a loss for the year ended December 31, 2010 of $2,246,280 ($0.06 per weighted average common share outstanding) compared to a loss of $6,480,005 (restated - $0.19 per weighted average common share outstanding) for 2009. The loss in the both 2010 and 2009 is increased as a direct result of the adoption of Emerging Issues Task Force (“EITF”) 07-05, Determining Whether an Instrument (or Embedded Feature) Is Indexed to an Entity’s Own Stock, which was primarily codified into ASC Topic 815, Derivatives and Hedging. ASC 815 applies to any freestanding financial instruments or embedded features that have the characteristics of a derivative and to any freestanding financial instruments that are potentially settled in an entity’s own common stock. ASC Topic 815 was effective January 1, 2009 resulted in a cumulative adjustment of $1,084,375 to accumulated deficit as of January 1, 2009. For the year ended December 31, 2010 we recorded a fair value change (gain) of $949,875 on warrants and $380,000 on preferred shares. The comparable effects in 2009 were a loss of $2,071,350 on warrants and $620,000 on preferred shares. Excluding the above, and other items such as interest and foreign exchange, our loss from our operations was $3,565,136 for the year ended December 31, 2010. The results for the same period of 2009 was a loss of $3,756,832. A significant difference in 2010 compared to 2009 was the level of exploration expenditures as the activities of the Company were moved back to the field from the pilot plant program. Exploration expense was $811,649 (2009 - $377,891), while engineering consulting expense was $42,799 (2009: $639,185). Consulting fees – directors and officers was $856,020 (2009: $1,182,776) as a result of lower stock based compensation recognized for previously issued options which vested during the year. Management fees of $620,689 (2009 – $139,200) reflects stock based compensation expense increases. Investor relations expense of $335 (2009 - $696,191) reflects the stock based compensation expense recorded with respect to the revaluation of the warrants in second quarter of 2009. Generally most other expenses were comparable or lower this year due to changes in operations and cost constraints applied earlier in the year. Office and rent related expenses rose as a result recognizing a full year of expenses in our new offices in Santiago. As of December 31, 2010 we had working capital of $3,384,696 (2009 - $1,263,449) including $3,766,959 (2009 -$1,343,994) of cash and cash equivalents. As of March 15, 2009, our cash position was approximately $2.6 million. During the year ended December 31, 2010, the Company completed an offering of 5,384,624 shares at a price of $0.65 per unit for total gross proceeds of $3,500,000. Share issuance costs for the private placement consisted of cash payments of $313,053 and issuance of 429,170 warrants at an exercise price of $0.65, to give net proceeds of $3,186,947. We have prepared a 2011 combined operating budget which incorporates general corporate and administrative expenses as well as a base case of Chilean operations plus engineering studies. We anticipate that expenditures, net of interest income will be such that we have sufficient funds for up to two years of operations, excluding 2009 drilling expenditures. The diversion of funds from general purposes to engineering and marketing will, however, reduce the period during which we can cover expenditures. We continue to actively source additional funds to meet or exceed the anticipated expenditures above. We believe that the prospects are such that we will be able to raise sufficient funds; however there are a number of risk factors which will influence our ability to do so, including the state of the capital markets generally, and the market price of our common stock. With the exception of funds on deposit, we have no other sources of committed funds, except for outstanding warrants for which there are no commitment to exercise. The most likely source of new funds would be an equity placement of common shares. We believe that a failure to raise funds in a timely manner would likely delay the achievement of some of the milestones in the engineering and marketing plans, and would delay any decision regarding the viability of operations while likely increasing future costs. The July 2005 funding agreement with Rubicon contained certain anti-dilution provisions, such that any subsequent funds raised below $0.80 per share may trigger provisions which require the issuance of additional shares or re-pricing of warrants held by Rubicon. This may influence our decision as to the suitability of any future financing. In 2007 we commenced an offering of securities at $0.50 which triggered a reduction in the warrant exercise price to $0.50 per share and increased the number of shares issuable upon exercise of the outstanding preferred shares by a factor of 1.6. During the year ended December 31, 2010, the Company did not have any off-balance sheet arrangements. We account for financial instruments or embedded features in accordance with Accounting Standards Codification Topic 815 - Derivatives and Hedging (ASC 815), which applies to any freestanding financial instruments or embedded features that have the characteristics of a derivative and to any freestanding financial instruments that are potentially settled in an entity’s own common stock. ASC 815 requires the warrants to purchase 6,875,000 shares of the Company’s common stock to be given the derivative treatment. The warrants had an exercise price of $0.50 per warrant and expire in July and September 2009, of which 4,250,000 warrants were extended to April 2011. As of December 31, 2009, the 4,250,000 warrants were fair valued using the Black-Scholes option pricing model with the following weighted average assumptions: risk-free interest rate of 1.08%, expected life of 1.25 years, an expected volatility factor of 84.10% and a dividend yield of 0.0%. The fair value of these warrants to purchase common stock increased to $2,956,725 as of December 31, 2009. As such, the Company recognized a $2,071,350 non-cash charge from the change in fair value of these warrants for the year ended December 31, 2009. As of December 31, 2010 the fair value was estimated to be $2,006,850, resulting in a gain of $949,875 for the year ended December 31, 2010. The Company accounts for stock-based compensation expenses associated with stock options and other forms of equity compensation in accordance with ASC 718-10, Share-Based Payment, as interpreted by SEC Staff Accounting Bulletin No. 107. ASC 718-10 requires the Company to estimate the fair value of share-based payment awards on the date of grant using an option-pricing model. The value of the portion of the award that is ultimately expected to vest is recognized as expense over the requisite service periods in the Company’s statement of operations. The Company uses the straight-line single-option method to recognize the value of stock-based compensation expense for all share-based payment awards. Stock-based compensation expense recognized in the statement of operations is reduced for estimated forfeitures, as it is based on awards ultimately expected to vest. ASC 718-10 requires forfeitures to be estimated at the time of grant and revised, if necessary, in subsequent periods if actual forfeitures differ from those estimates. We have audited the accompanying consolidated balance sheets of White Mountain Titanium Corporation (An Exploration Stage Company) as of December 31, 2010 and 2009, and the related consolidated statements of operations, cash flows and stockholders' equity (deficit) for each of the years in the three-year period ended December 31, 2010, and the cumulative period from inception (November 13, 2001) through December 31, 2010. These financial statements are the responsibility of the Company's management. Our responsibility is to express an opinion on these financial statements based on our audits. We conducted our audits in accordance with standards of the Public Company Accounting Oversight Board (United States). Those standards require that we plan and perform an audit to obtain reasonable assurance whether the financial statements are free of material misstatement. An audit includes examining, on a test basis, evidence supporting the amounts and disclosures in the financial statements. An audit also includes assessing the accounting principles used and significant estimates made by management, as well as evaluating the overall financial statement presentation. We believe that our audits provide a reasonable basis for our opinion. In our opinion, these consolidated financial statements present fairly, in all material respects, the financial position of the Company as at December 31, 2010 and 2009, and the results of its operations and its cash flows for each of the years in the three-year period ended December 31, 2010, and the cumulative period from inception (November 13, 2001) through December 31, 2010 in conformity with accounting principles generally accepted in the United States. The accompanying consolidated financial statements have been prepared assuming that the Company will continue as a going concern. As discussed in Note 2 to the financial statements, the Company has no revenues and limited capital, which together raise substantial doubt about its ability to continue as a going concern. Management plans in regard to these matters are also described in Note 2. These financial statements do not include any adjustments that might result from the outcome of this uncertainty. As discussed in Note 13 to the consolidated financial statements, effective January 1, 2009, the Company retrospectively adopted the presentation and disclosure requirements of Accounting Standards Codification 815 and restated the 2009 consolidated financial statements accordingly.